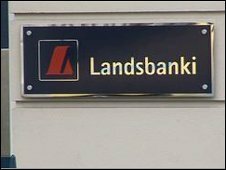 British citizens living in Guernsey and Jersey who lost money in the collapse of the Icelandic bank Landsbanki should not get compensation, UK MPs have said. The Treasury Select Committee report said the UK government could not compensate losses in jurisdictions outside the direct control of the UK. But it did acknowledge that offshore savers were not informed of the "changing risk profile" of savings. Over 2,000 islanders had about £20m deposited in Landsbanki Guernsey. So far Guernsey and Jersey savers have received just 30p compensation from the administrators for each pound lost when the bank collapsed in October. Hundreds of letters were sent to the select committee by members of the Landsbanki Guernsey Depositors Action Group (LGDAG) calling for it to recommend UK government help. Matthew Dorman, from the LGDAG, said "The report calls for closer co-operation between the Crown Dependencies, UK government and the respective regulators. "I hope we see the evidence of this co-operation in the near future, to prevent further bank failures as a result of poor regulatory communication." Mr Dorman was critical of the States of Guernsey and Guernsey Financial Services Authority for, what he claimed was, a "disappointing lack of presented evidence" to the committee.